Even by President Trump's standards, these tweets were shocking. On Thursday morning, while MSNBC's "Morning Joe" was on the air, Trump posted a pair of hateful tweets about co-hosts Joe Scarborough and Mika Brzezinski. MSNBC responded with this statement: "It's a sad day for America when the president spends his time bullying, lying and spewing petty personal attacks instead of doing his job." The president's deputy press secretary, Sarah Huckabee Sanders, defended the tweets by saying Trump was responding to the "outrageous attacks that take place" on "Morning Joe" and other shows. Trump refuses to be "bullied," Sanders said on Fox News. "This is a president who fights fire with fire." Trump's tweets in the 8 a.m. hour on Thursday said that "Morning Joe" is "poorly rated" (it's not) and that the hosts "speak badly of me" (that's true). He called both hosts disparaging names. Trump claimed that Scarborough and Brzezinski courted him for an interview at Mar-a-Lago around the New Year's Eve holiday. For the record, photos from Mar-a-Lago do not show any blood or bandages on Brzezinski's face. Democratic commentator Maria Cardona, speaking on CNN, said it was part of a pattern of misogynistic behavior by Trump. "We should not normalize this," she said, calling it "unacceptable and unpresidential." Lawmakers immediately condemned the president's tweets, as well. "Mr. President, your tweet was beneath the office and represents what is wrong with American politics, not the greatness of America," Senator Lindsey Graham, a Republican, tweeted. "As the First Lady has stated publicly in the past, when her husband gets attacked, he will punch back 10 times harder," her communications director Stephanie Grisham said in response to reporters' questions. Observers also expressed a lot of skepticism about Trump's Thursday morning claim that he doesn't watch "Morning Joe" anymore. The president is known to watch all the major morning shows, including the programs on Fox News, CNN and MSNBC'. He sometimes calls up pro-Trump guests to thank them for their remarks on the shows. Trump had a friendly, jovial relationship with "Morning Joe" during the presidential campaign, but it turned sour over time. At one point he called Brzezinski "very insecure" and threatened to expose her off-screen relationship with Scarborough. Thursday's anti-media tweets were astonishing -- and part of a pattern. On Wednesday Trump went after two of the nation's biggest newspapers, The New York Times and the Washington Post. 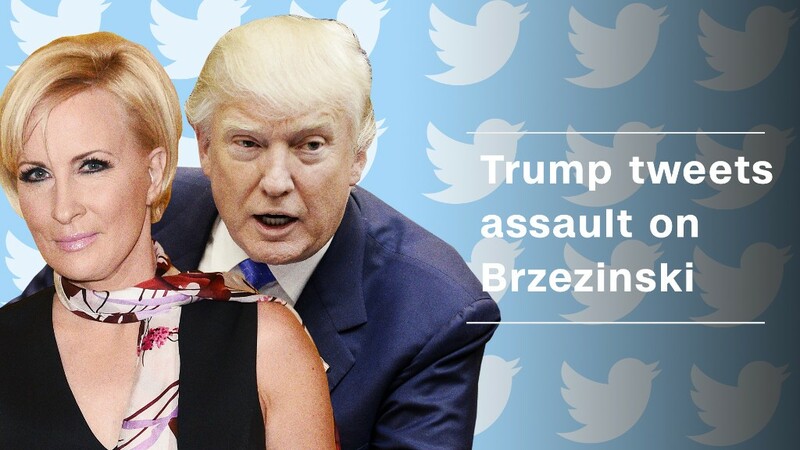 Brzezinski responded to Trump Thursday morning with a tweet of her own, mocking him with a reference to "little hands," a reference to a disparaging idea about him that has circulated for years. Mark Kornblau, the head of PR for NBC News and MSNBC, also weighed in on Twitter, saying, "Never imagined a day when I would think to myself, 'it is beneath my dignity to respond to the President of the United States.'"